Hey friends! I have another giveaway for you today! But first if your name is Julie and you were comment number 18 on the Green Giant Giveaway then you are the winner and need to contact me ASAP! For everyone else, today’s giveaway is for some Cheerios! I am a huge fan of Cheerios (I mean how can you not be?). I eat them for breakfast topped with fresh banana slices or blueberries (or sometimes if I am all crazy I top it with both). I also get buck wild and make crazy things like S’mores Snack Mix or Chocolate Chex Mix with Cheerios. Because Cheerios are awesome like that! As a savvy Club member, you can recognize the value of buying Cheerios® cereal at your local Costco, Sam´s Club or BJ´s. While buying Cheerios at Club is already easy and affordable, new 2 box Cheerios packaging format makes Cheerios an even better purchase! You can cheer on the value by purchasing the new 2 box Cheerios packages in Club! 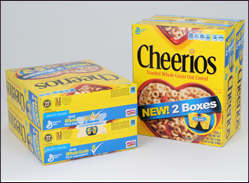 •New 2 box Cheerios contains two individual boxes, making them easier to store and easier to pour! •While each box contains more cereal, packaging material has been reduced by over 200,000 lbs, saving 1,000 trees and taking 130 Cheerios trucks of the road, decreasing CO2 emissions. New and improved 2 box Cheerios are now available on the shelves of Costco, Sam´s Club and BJ´s nationwide. 1. Leave a comment stating when is your favorite time to enjoy a big bowl of Cheerios. Is it for breakfast, lunch, dinner, an afternoon snack, a midnight snack, a pre workout fuel? This give-away closes Sunday, May 13, 2012 at 11:59 PM CST. Winner will be chosen at random (by random.org) and will be announced sometime shortly after the give-away ends. Winner must contact Kitchen Concoctions within 72 hours at kitchen_concoctions at hotmail dot com to claim prize. If winner has not claimed prize within 72 hours then a new winner will be notified. Giveaway for US residents only. I really only eat cereal as a late night snack, since usually in the morning I am running late and only have time for a banana or bagel as I run out the door. I like cereal for breakfast! I am a facebook fan of Kitchen Concoctions. I love a big bowl of Cheerios anytime of day! I eat a bowl of cereal every morning! Since I am not a very good cook I eat cereal a lot. I love Cheerios especially topped with a fresh banana!